Layla, a 7½ -year-old, 2,300-pound eastern black rhinoceros who lives at Brookfield Zoo, recently underwent what is believed to be the first CT (computed tomography) scan ever performed on this species. The scan was necessary to help veterinarians determine the next steps for treating an obstruction in Layla’s nasal passageway. 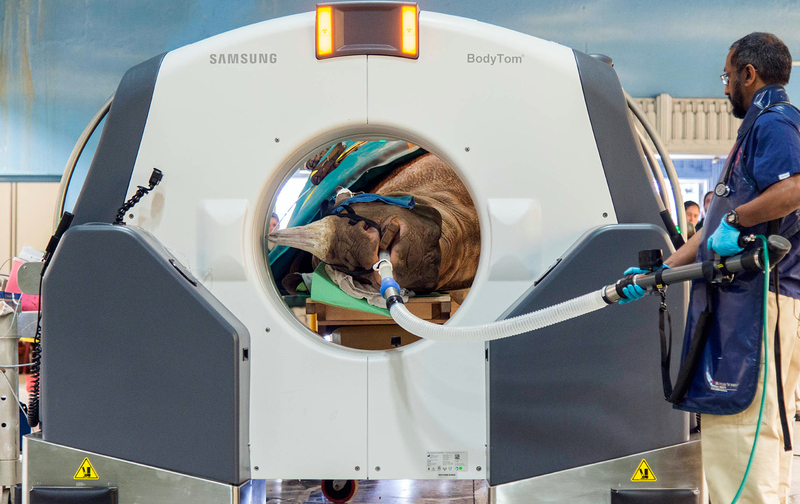 Layla was too large to move inside the zoo's animal hospital, where the zoo's CT scanner is located, so staff brought a CT scanner to Layla’s habitat instead. NeuroLogica, a subsidiary of Samsung Electronics, generously donated the use of its BodyTom®, the world’s first battery-powered, portable, 32-slice CT scanner, for the procedure. The process of moving Layla to and from the machine was extraordinarily delicate and required the presence and precision of a team of nearly 40 dedicated zoo staff, as well as technicians from NeuroLogica and Sound Technologies, who donated their services to set up and operate the CT machine. Layla began experiencing difficulty breathing in December 2017 and was diagnosed with obstructive sinusitis. Rhinos are obligate nasal breathers, meaning it is difficult for them to breathe comfortably through their mouth for long periods. 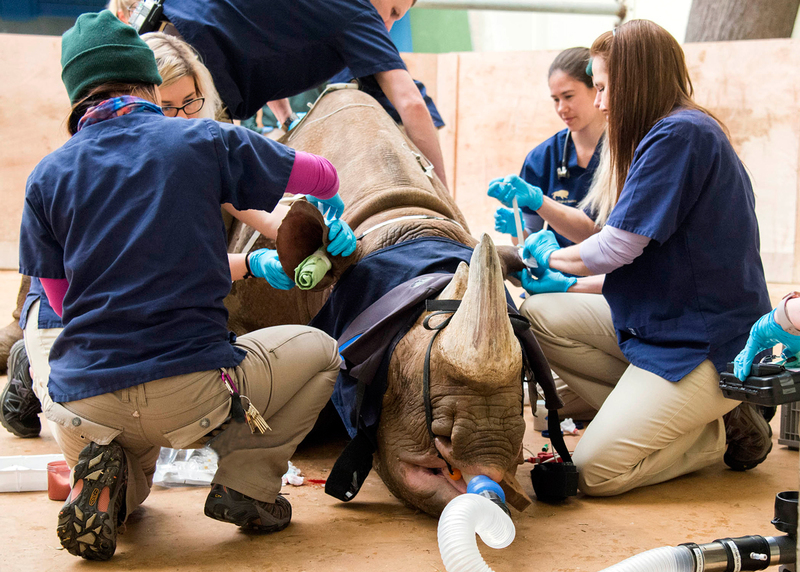 Any sort of nasal obstruction can therefore become dangerous, and after failing to respond to standard medical treatments, Layla underwent bilateral sinusotomy surgery at the zoo on January 29, 2018. Veterinarians were able to identify a bacterial infection in her nasal passageway. For the surgery in January, CZS staff brought in Drs. Anthony Blikslager and Mathew Gerard, board-certified veterinary surgeons from North Carolina State University, College of Veterinary Medicine, to assist with the procedure. The two surgeons, who have extensive knowledge related to rhinoceroses’ skull and sinuses, have been working on developing surgical methods to help treat rhinos in Africa that have had their horns cut off by poachers. This surgery significantly improved Layla’s comfort levels and allowed staff to begin treating her infection. Over the past two months, Layla has been anesthetized on a weekly basis for intravenous antibiotic therapy and to continue debulking, or removing, infected tissue through two surgical holes created to access her sinuses. However, despite her progress, the initial surgery was unable to identify the source or extent of the problem, and it was determined advanced imaging was needed to complete treatment. On April 19, staff got their answers—the images obtained on the CT scan have revealed abnormal tissue associated with the root of one of Layla’s upper molars. The growth of this tissue is causing the obstruction in her nasal passages and sinuses. 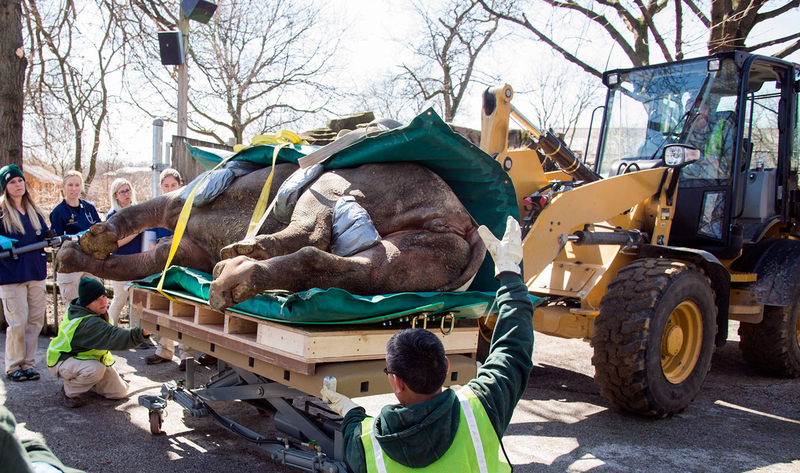 To prepare for the CT scan procedure, the Chicago Zoological Society’s carpenters constructed a custom-made platform. After being anesthetized and stabilized, Layla was carefully slid onto the platform and a front-end loader was used to gently move her onto the zoo's large surgical table. Animal care specialists and grounds staff then carefully moved the table to the portable CT scanner set up in the Pachyderm House. The flawless procedure was possible, in part, due to several practice runs staff had performed using 2,300 pounds of concrete to simulate Layla's weight. 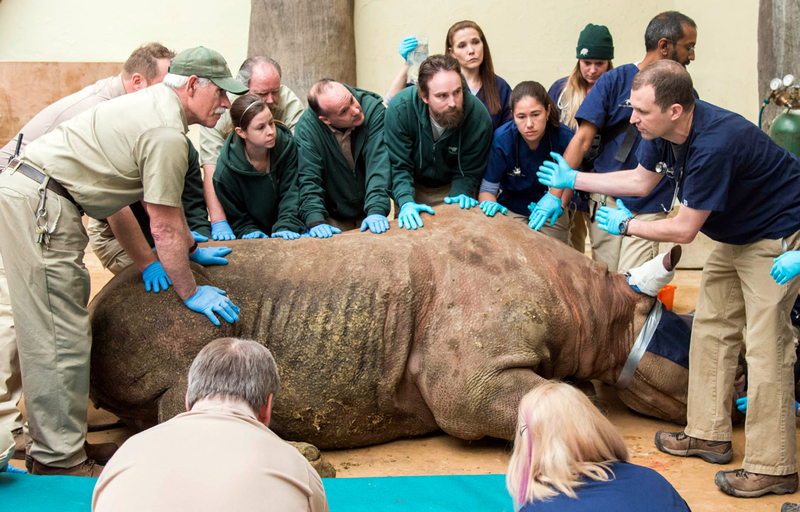 Animal care staff monitored Layla closely following the procedure. She currently is comfortable in an area behind the scenes, while veterinarians are developing a plan to surgically remove the remaining abnormal tissue and to provide subsequent treatment for Layla. Layla was born on October 18, 2010, at Kansas City Zoo in Missouri. She arrived at Brookfield Zoo in 2012 on a breeding recommendation from the Association of Zoos and Aquariums’ Eastern Black Rhinoceros Species Survival Plan (SSP). There are currently 59 eastern black rhinoceroses in North American zoos. This species is considered critically endangered with approximately 5,000-5,400 individuals living in the wild. “Not only is Layla valuable to the rhinoceros population in professional care, she also plays an important role at Brookfield Zoo by raising awareness about the species and why conservation efforts are so critical,” said Amy Roberts, senior curator of mammals for CZS. “When our guests come to see Layla and our other black rhinos, we hope they will be inspired to care about these amazing animals so that future generations will be able to also appreciate them.